I’m happy to say that I didn’t cry after all. As my mother wished, upon her death three years ago, we donated her body to the local medical school – State University of New York at Buffalo (UB). Every 18 months or so, UB holds a memorial service for the families of all those whose bodies have been used to train new medical students. Today was the service which included my mother. You will recall from a recent post that notice of this service hit me hard, but I felt I owed it to Mom to honor her memory. Although I knew the service would be for more than just my own mother, I expected it to be a rather small ceremony attended by maybe 30 or 40 people. Last night, we learned there would be around 500 people in attendance!, and I seriously debated the wisdom of attending what I now perceived might be a real circus. But, again, I owed it to Mom. As we approached Skinnersville Cemetery on the UB North Campus, traffic became a nightmare as people tried to find parking on both shoulders of the narrow road. Hubby dropped my daughter and me at the corner and drove off to park in one of the student lots. Seeing as school is in summer session, and it was the closest lot to the cemetery, we took a chance that no one would object – really, how low would it be for some security person to complain when the parking lot was only half full and people were obviously coming back from the memorial service for their dearly departed? It was a gorgeous day, sunny and mid-60s. The service itself was held under a humungous tent. It was obvious from each and every speech that the staff and students were truly appreciative of the donors (dead people, to be politically incorrect) and that the donors had been treated with kindness, respect and compassion. SEE THE BOX THE GIRL IS HOLDING? After the ceremony, all 500 or so family members walked over to the gravesite. There, the university chaplain said a short prayer and then turned to several young girls who were holding small cardboard boxes. My initial thought was those boxes were much too small to hold the ashes of all the donors for the past 18 months – and then I realized the grave was already filled in, so I would assume the ashes had already been buried. Silly me. For all I know, the grave was empty (it wasn’t), and I really don’t want to know either way – and for sure, I would not have wanted to stand there watching ashes poured into a grave. The boxes, we soon discovered, contained butterflies. It is said that if you whisper your dead loved one’s name to a butterfly, the butterfly will then take your love to that departed person. 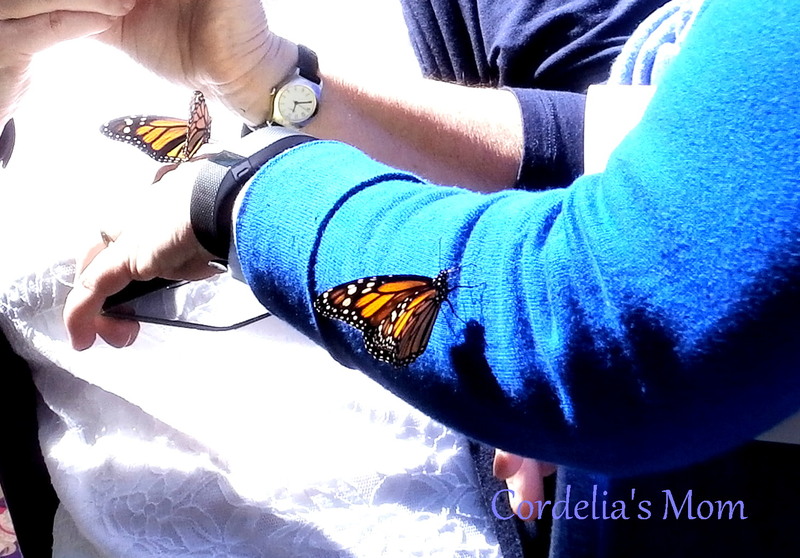 Upon receiving the chaplain’s direction, the boxes were opened, and the butterflies …. didn’t do anything. The poor girls wound up tapping and shaking the boxes to get the traumatized butterflies to take flight. And then the butterflies flew. Several of them alighted on the lady standing next to me, and one landed on the lady standing behind me. Not one came to me. Does that mean my mother is mad at me? Or maybe those other two ladies were simply wearing some sweet-smelling perfume. 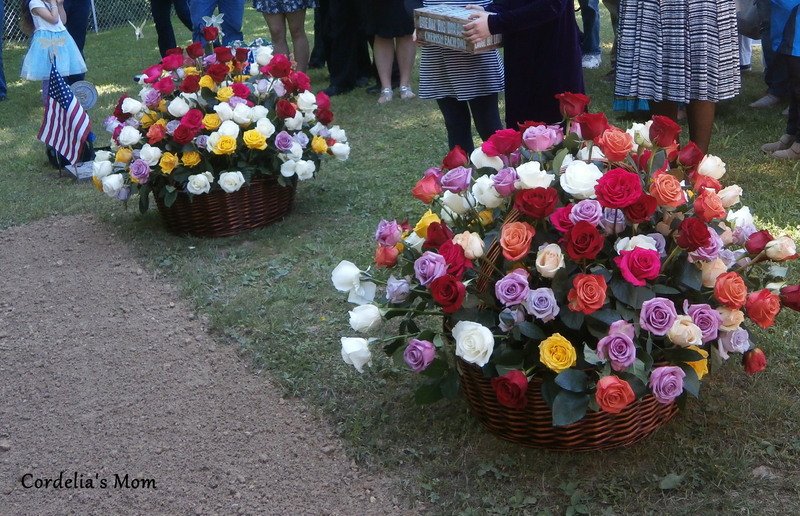 Everyone was invited to take a rose from the graveside, and each family member was also given a bag containing a bread board crafted by a local artist, along with a small bottle of oil to preserve the wood. The boards were commissioned by UB as a thank you to each donor’s family. Such a sweet way to remember a departed loved one. Each of my younger daughters took one to remember Grandma, and I took one to give to Cordelia, who was unable to attend due to responsibilities at her new job. The red rose I kept. Teddy Rosalie was there with me, but I didn’t feel it appropriate to include her in the graveside photographs. I think perhaps I’ll return to U.B. some sunny Sunday in the future and devote some time to photographing the grave, the cemetery and the surrounding area. Teddy Rosalie will go with me. I think my Mom would like that. This entry was posted in Relationships, Teddy Rosalie, That's Life and tagged anatomical gift, bereavement, cemetery, funerals, loss of loved one, memorial service, mother, Skinnersville Cemetery, State University of New York at Buffalo, UB. Bookmark the permalink. We are, and I’ve already submitted the paperwork to do the same thing when my time comes (hopefully not too soon, though). I think the butterflies are attracted to heat. They land on me all the time. Were you perhaps wearing white? that is the coolest color. Such a wonderful memorial. it is pleasing that the university remembers that way. I think that lady may have been standing out in the sun longer than I was, so maybe heat is the answer. Cool COLOR cm,cool COLOR. Sheesh. Of course you are hot – they most often land on my skin in the sun (arms). That was beautiful to read and informative too. Thanks! I’m glad you enjoyed it. The event was much more meaningful than I ever expected it would be – UB is an incredible university. We did not have anything like that done for families when I was in med school. I wish we had. UB may be one of the few schools who does this. I don’t know who thought of it originally, but it’s a very special way to remember the donors. What a beautiful service, CM! 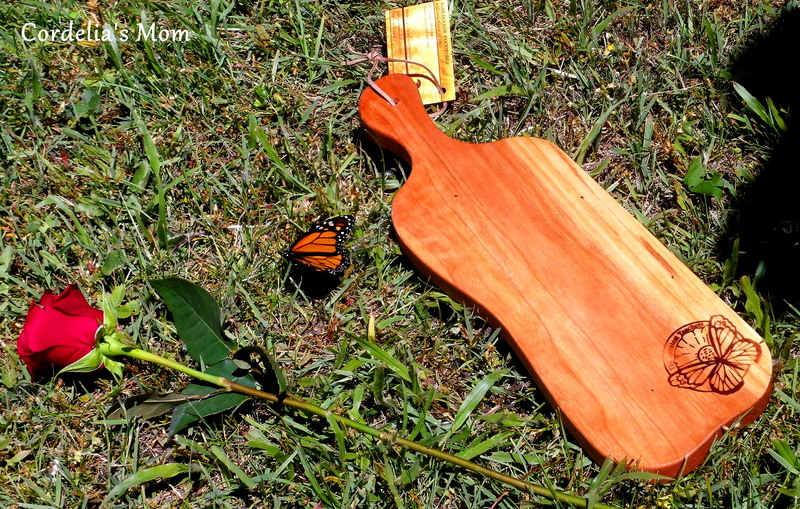 Oh, you do not need a butterfly to affirm that your Mom was there. She was there with you in spirit and she has lived in your heart since and forever. I know she was. Teddy Rosalie told me so. I read this earlier and could not comment…. (was mobile an not logged in) anyhow, what a nice service this seemed like – and the butterflies (and roses and boards etc) are just so nice to celebrate these lives and their contribution to helping science. It was uplifting. I’m glad I went. I am glad you attended what sounds like a very special service. Thanks to your mom for wanting to serve in his unique way, and thank you for sharing this with us. When my Dad died, my mom donated his body as he hadn’t left any instructions on what he wanted done, and my mother had no money (there was no life insurance). Then my mother decided it was a good way to save her children the cost of a burial – and had the plus of providing education to the medical students. I’ll do the same when my time comes. You may not have cried, CM, but I certainly did. What a beautiful way to remember her, and how thoughtful of the medical school. I’ve long said I want to do this with my body when I go (like you, not too soon!) but have never filled out the paperwork. Time to get going! During the ceremony, one of the speakers said that UB currently has 15,000 people who have filed the paperwork. I can tell you this, Elyse, which I didn’t talk about in the post – I was very impressed with the UB staffers who drove all the way to Jamestown to collect my mother’s body. I could tell by the way they handled her that she would be treated with respect. They were also very compassionate with the family members who were still by her bedside. I have no qualms about donating my body when my time comes. How absolutely beautiful. The butterfly symbol was heart warming and loving, as was the taking of a rose and the board for remembrance of the Day. And we had beautiful weather on top of it. I think God was smiling that day. I want to personally let you know how much bodies donated to science help. This very hard, loving act helps society. Please know, the sacrifice is honored and bodies are treated with respect. It is a generous gift to society. I am personally grateful to all who donate. It changes the world for all of us. Thanks, Linda, and thanks for the re-blog. I was a little surprised to learn that first-year medical students are the ones who take the anatomy class. For some reason, I always thought that would come later in the medical course. But I guess that’s a good way to find out right off it the students can handle it. Reblogged from Cordelia’s Mom, Still. A lot of people are unaware the anatomical gifts are possible. I only knew about it because my Dad’s body was donated when he died, and then my mother signed up. Lovely. As a doctor we are very grateful to the donors and the ceremony sounds very fitting. I’m very pleased that you’ve found the time to read the post. I don’t know that I could go through an anatomy course – I had a hard enough time with the frog in high school! But I understand that books simply can’t provide all the knowledge that is needed for a medical career. Thank you. I don’t recall anyone who didn’t love my mom. She was a kind, smart, strong woman. I wished I had realized that when I was in my teens and 20s. youth is like that. I am still thinking of your post-the beauty of your moms’ thoughtfulness-her generosity with the planet-thinking of others while thinking of her death-that is an amazing act. What a lovely surprise, with the butterflies. I think this is a wise choice and I think I’ll research it a bit. It’s a good way to give back, so long as you and your family can handle the idea of your body being used for training. I know I had a hard time with that when I really thought of what my mother had signed on for.